The 2017 tornado season has been much more active than last year's to this point. We had six tornadoes in Texas yesterday with four in the Houston metro area. We have a risk of tornadoes in the Southeast today. I have included the scale. The threshold I consider significant (enough to make me want to monitor the weather when thunderstorms approach) is 5% (brown). The highest probabilities are very rarely used values of 45% and 60%. 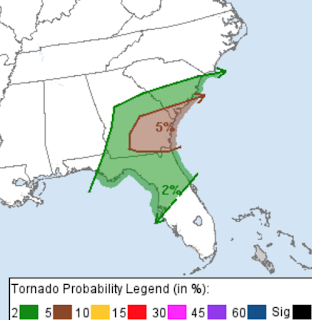 The definition of the probability is the chance of one or more tornadoes within 25 miles of any given point. When you see black hatching it means the tornadoes are forecast by the NWS Storm Predication Center to be "significant" -- meaning EF-2 or stronger in intensity.